Dark spots? Acne prone? Combination? Dullness? I have it all. Most products on the market these days only concentrate on one concern at a time. While that may be effective, people like me who want to tackle multiple concerns are forced to use mountains of products or left with the costly proposition of switching from product to product. Over the last seven years I've regularly changed my skin regime depending on what I thought my skin needed. During summers I would incorporate high SPF creams, winters would entail more moisturizing, and anything in between I would switch between acne and brightening products. Sounds like I couldn't stick to a routine where my skin can get used to since it was absorbing all these different kind of products at the same time. I knew I had to do something about it so I was very excited when Clinique came out with a custom repair serum that focuses on your own skin's needs, an all inclusive solution that tackled everything. Just what I needed. 1. Clinique Custom-Repair Serum - A sales lady at the airport, with her amazing sales pitch, persuaded me to purchase this and I'm glad I did. This particular one is formulated for Asian skin which I purchased at the Hong Kong airport. I haven't been able to find the Asian formula in California, so I'm glad I purchased two while I was there. I've been using this for about 7 months now and my dark spots have been noticeably diminished, my skin is more radiant and even though I'm still a bit oily, my skin is not as dry as it used to be. 2. 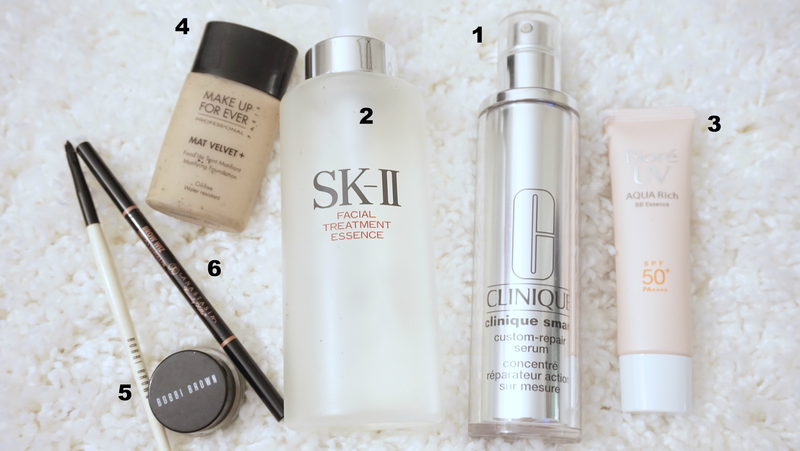 SK-II Facial Treatment Essence - I'm sure everyone has heard of this and at one point tried it or incorporated it into their regime. I've been using this for over 2 years and it moisturizes really well for me without that sticky feeling although I haven't seen any anti-aging benefits from it yet. 3. Biore Aqua Rich BB Essence - I recently read about this on a well regarded Japanese cosmetic site Cosme which has product rankings from actual users, and this product was #1 on their list for 2015. At first I thought it was a BB cream but it feels more like a refreshing lotion that has minimal coverage. It's been great for me! It doesn't leave a sticky feeling and provides broad spectrum sun protection. It's also a great makeup primer. 4. Make Up Forever Mat Velvet Foundation - After putting the Biore cream, this foundation goes on pretty smoothly without feeling heavy and cakey. It goes well with my oily skin and gives a beautiful matte finish. 5. Bobbi Brown Gel Eyeliner - This is by far my favorite eye liner of all time! I've been using this for at least 4 years now. Even though I've tried other eye liners, I always end up going back to this. The gel is very smooth that it's literally fool proof in creating that perfect eye look you want. 6. Anastasia Brow Wiz - This is also my favorite of all time, I've been a loyal user for almost 2 years. I have tried others like Smashbox, Benefit, Eyeko and other Japanese and Korean brands, this is by far still the best. The pencil just flows through my eyebrows elegantly without creating harsh lines. Perfect looking eyebrows every time!